2 Bedroom Terraced House For Sale in Bolton for Offers in the region of £120,000. Well presented modern townhouse located within the ever popular area of Smithills in Bolton. In brief the accommodation comprises a lounge and kitchen/dining room to the ground floor with two good sized bedrooms and a bathroom to the first floor. 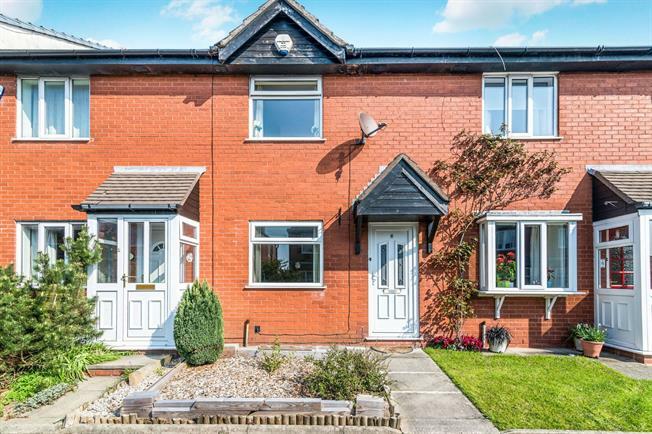 Further benefits to the property include gas central heating, double glazing and a rear garden. Internal inspection is recommended. UPVC front double glazed door. Double glazed uPVC window facing the front. Radiator, carpeted flooring, original coving, ceiling light. Back , opening onto a balcony. Double glazed uPVC window facing the rear overlooking the garden. Radiator, laminate flooring, ceiling light. Fitted and wall and base units, stainless steel sink with drainer, integrated, electric oven, integrated, gas hob, space for washing machine, fridge/freezer. Double bedroom; double glazed uPVC window facing the rear overlooking the garden. Radiator, carpeted flooring, ceiling light. Double bedroom; double glazed uPVC window facing the front. Radiator, carpeted flooring, ceiling light. Radiator, vinyl flooring, tiled splashbacks, downlights. Low level WC, panelled bath, shower over bath, pedestal sink, extractor fan.